The image above is of a jiffy bag that I received in the post this morning. Being the wary soul that I am, I was immediately suspicious of this package and so inspected it in more detail. On face value it looks like an official upgrade pack, perhaps from the satellite broadcaster BSkyB? They do occasionally update their viewing cards and so this seemed quite likely. This package contains promotional material from Virgin Media. I should have guessed as much when I saw that it was addressed to “The Occupier”. This is a well known tactic of Virgin Media to stop their tat being classed as addressed mail and thereby sidestepping the Mailing Preference Service. I’ve never been able to shake off Virgin’s junk mail, I don’t think anyone ever has. So this package isn’t anything to do with satellite TV at all. It’s yet more pointless unsolicited junk mail from Virgin Media. A quick bit of web searching and I found a recent Advertising Standards Authority (ASA) Adjudication on Virgin Media Limited. The conclusion of the adjudication was that Virgin Media had breached two Committee of Advertising Practice codes and that their advert was misleading. 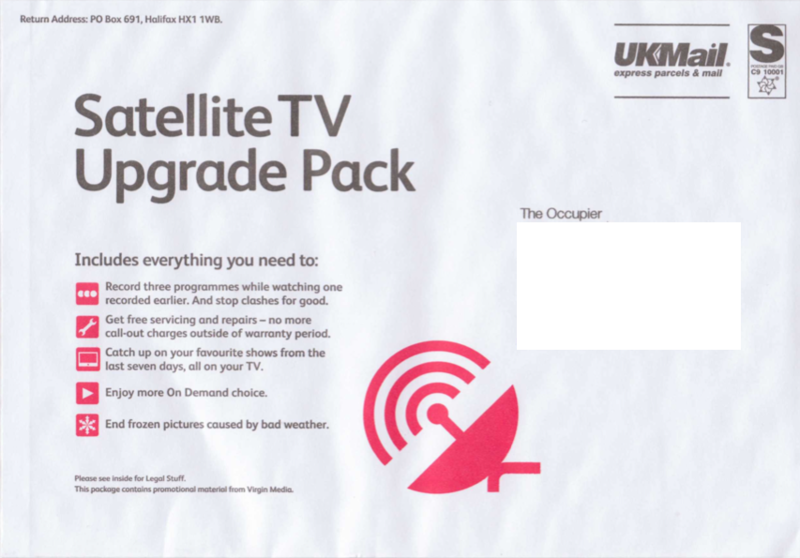 The ASA noted the text “This package contains promotional material from Virgin Media” was considerably smaller than the main copy on the front of the envelope, was at 90 degrees to all the other text on the envelope, and was located far to the right of the envelope under a series of reference numbers. We considered that the combination of those factors meant it was likely to be overlooked by consumers and that consumers would therefore be unaware that the envelope contained promotional material from Virgin. We noted Virgin considered the text “Please see inside for Legal Stuff” indicated that the envelope contained promotional material. However, we considered that that statement was unlikely to be understood by consumers to mean that the mailing was a marketing communication. We considered, for instance, that the placement of that statement, combined with the likelihood that consumers might not have noticed the text which identified that the mailing was from Virgin, could lead consumers to think that the envelope contained legal and other information, and possibly technology, from their satellite TV provider which would result in an upgrade to their existing satellite TV package. We considered the ad did not make clear that it was a marketing communication, or that it was sent with commercial intent, and concluded that it breached the Code. The ASA adjudication is dated 2nd November 2011, but I received this package today on 16th November 2011. It looks like Virgin have subtly altered the layout on the envelope and moved the line about it being promotional material, but this doesn’t make it any less misleading. A complaint to the ASA has been submitted. Let’s see what happens this time! Further to my letter of 21 December, we have now received a response from Virgin Media. They have assured us they will not use the ad or similar ads again and that in future mailings they will make clear that they are marketing communications. We consider that this will resolve the complaint without referring the matter to the ASA Council, and will consequently be closing our file. In a formal investigation, if the ASA Council decides that an ad is in breach of the Code, the advertisers are told to withdraw or amend it. Because Virgin Media has already assured us that the advertising you complained about has been withdrawn, we consider there is little to be gained from continuing with a formal investigation, which would achieve the same outcome. So a small victory for the small guy then. This entry was posted in General, Rant, Scams and tagged A11-164261, ASA, Virgin Media by djh. Bookmark the permalink.